Premier Li Keqiang urged Macao to seize development opportunities and improve people’s lives for a better future. Premier Li Keqiang announced a planned renminbi clearing center to exchange currencies with Portuguese-speaking countries. Premier Li announced 18 measures in Macao to boost ties with Portuguese-speaking countries in various fields. 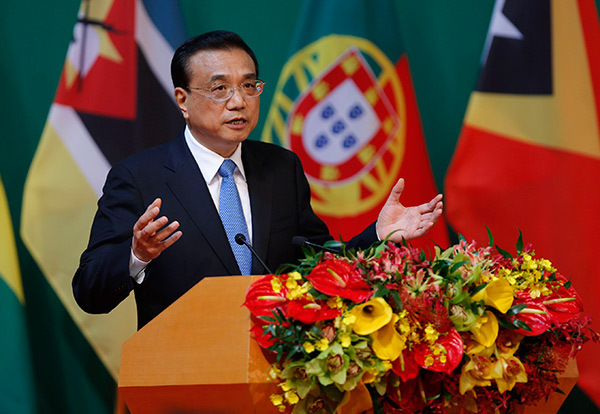 Premier Li on Oct 11 delivered a speech at a cooperation forum between China and Portuguese-speaking countries. Premier Li Keqiang said in Macao on Oct 11 that China is willing to build more substantial economic and trade ties with Portuguese-speaking countries. Premier Li showed great enthusiasm about the high-tech equipment manufacturing during a half-day tour in Guangdong. Premier Li Keqiang vowed to further lower the threshold of market access for innovative companies to create more jobs.